It’s that time of year again where fishing starts to slow down a bit due to the weather and season change. 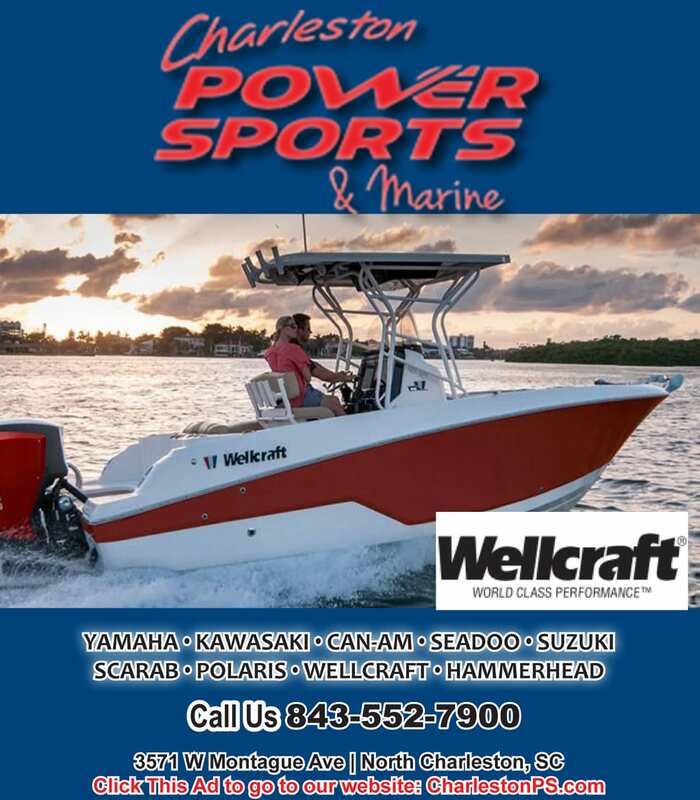 However, if you don’t have much luck catching Wahoo or Blackfin Tuna then bottom fishing is the way to go. 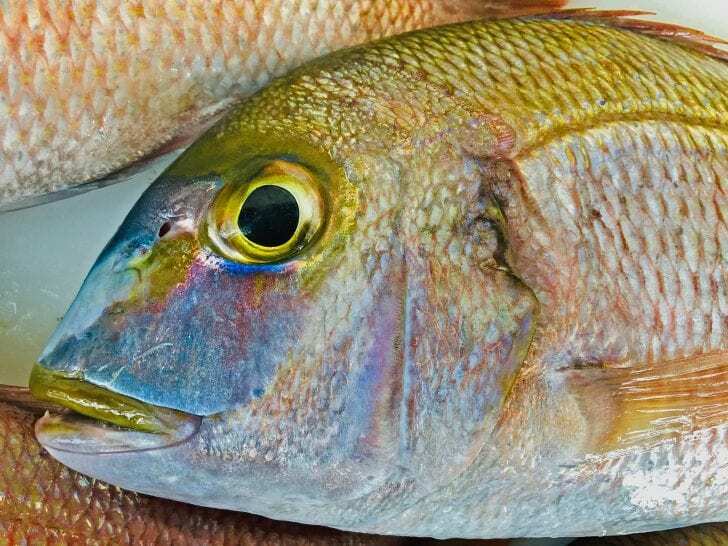 One of my favorite fish to catch and cook is the Red Porgy or Pink Snapper. These fish put up a great fight and also have a great flavor. I generally prefer to cook my fish whole and this is why I chose this dish this month. 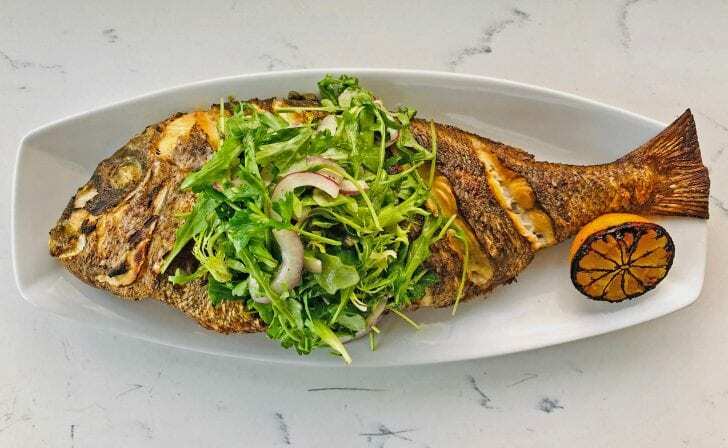 I am preparing a whole grilled Red Porgy with an Arugula salad tossed with a cider vinaigrette and accompanied with red onion, capers, flat leaf parsley, frisee lettuce, grilled scallions, and a grilled lemon. In my opinion cooking fish whole results in a moister finished product. To start, I will get the fish and scale it. Be cautious of the spines on the fins. After it is scaled I will gut it and then remove the gills and fins( I clip the caudal or back fin with scissors because it usually will get charred otherwise). Now that the fish is scaled, cleaned, and fins removed I will reserve it. I prefer to eat my whole fish within 2- 3 days of catching it. I find it tastes better after a few days to let the natural bacteria break down the fish a little bit. Don’t get me wrong you can eat it right away but this is what I prefer. As far as ingredients goes you will need the following- 3 T Dijon mustard, 3 T honey, 1 shallot, ½ bunch chives, ½ bunch tarragon, ½ cup blended oil, ¼ cup cider vinegar, 2 lemons, arugula, 1/2 red onion, capers, 1 bunch flat leaf parsley, 1 bunch scallions, and frisee lettuce. To start I will get the vinaigrette ready. In a small bowl add you mustard, vinegar, and honey. Whisk together and slowly drizzle in the oil. From here add your finely diced shallot, cut chives and tarragon, and salt and pepper to taste. When you can get all your other salad ingredients ready in a bowl. Get you Arugula, Frisee, picked flat leaf parsley, finely shaved red onion, and capers in a bowl and reserve in the fridge. You will add the vinaigrette and grilled scallions last minute. Now that all this is ready its time to grill the fish. Start by firing your grill up on the highest temp it will go depending if you are using charcoal or propane. I will also turn my oven on in the house to about 400 degrees. I will put a few scores on both sides of the fish and apply salt, pepper, and oil. Clean and oil your grill as well. 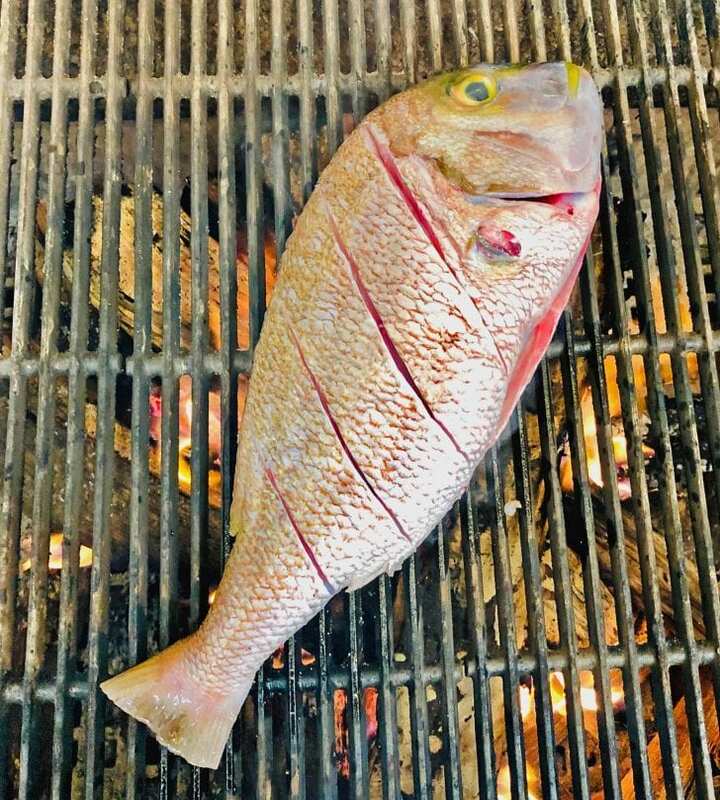 Put the fish on the grill and mark it on both sides. If the fish is small you can cook it all the way on the grill but if it is bigger you might want to finish it in the oven. Whole fish generally takes about 10-15 minutes depending on the size of the fish. I score it so you can see if it is done. It should look opaque and the flesh will release from the bone easily. Right before it is done throw your lemons and scallions on the grill. When it’s done rub with butter and fresh squeezed grill lemons. Get your salad and add the vinaigrette and grilled scallions (cut them about 2 inches long) and put right on top of the fish and serve immediately. Feel free to add or take out ingredients of your liking, see the full recipe details below. – Chef Kyle Kryske is a native of Pascagoula, MS. He is a graduate of Johnson & Wales University & has resided in Charleston for 15 years. He has been cooking in restaurants for 18 years. working in MS, AK, NC, and SC. 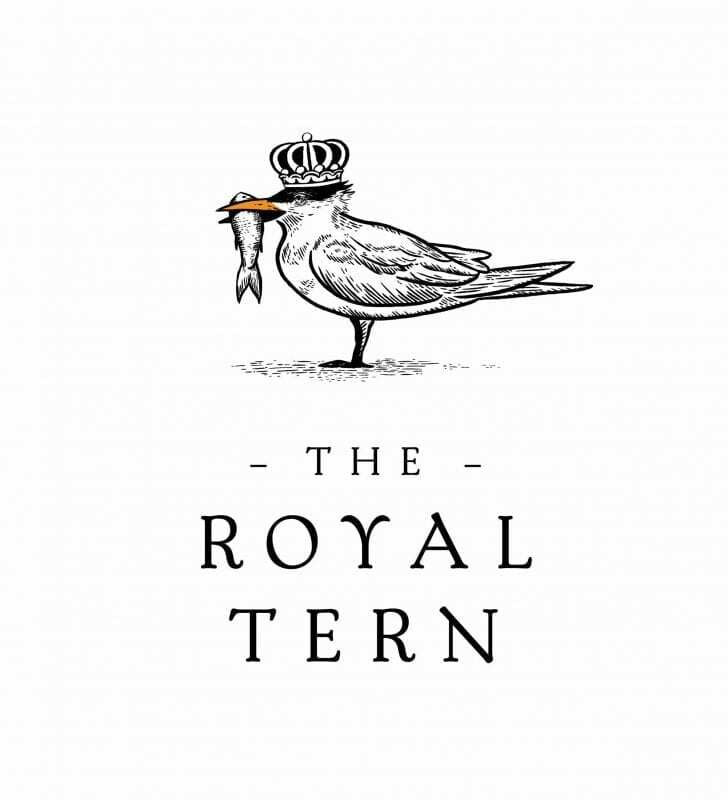 and is Chef de Cuisine at The Royal Tern Restaurant on Johns Island, SC. 2. Take you cleaned, scaled, and gutted fish and score a few slits on each side. Season well with salt and pepper. Put on a very hot grill. If the fish is large mark it on both sides and finish it in a 400 degree oven for about 10-15 minutes max. 3. Grill the lemon halves. 4. When the flesh pulls away from the bones it is ready. 5. Immediately toss the salad and put on top of the fish and serve. Enjoy!